Jim Phipps, Sheffield United’s co-chairman, has described John Brayford’s arrival from Cardiff City as a “statement of intent” by the League One club, writes James Shield. 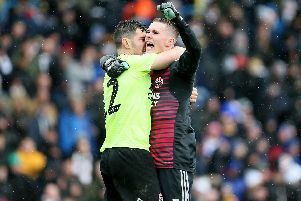 But Phipps, speaking after the defender agreed a three-and-a-half year contract at Bramall Lane, refuted suggestions the decision to spend a seven figure sum acquiring his services represented a panic response to the sight of Nigel Clough’s side falling 18 points off the automatic promotion pace. Phipps, speaking ahead of tomorrow’s Capital One Cup semi-final against Tottenham Hotspur, told The Star: “It’s a statement of intent. “He’s cup tied. We are doing it to address the needs of our club for a promotion fight. “It’s an unusual League One acquisition. It’s an acquisition which is intended to be good for us this year, next year and the one after that. “It’s a substantial investment and reflects our commitment. We are going to spend real money but there will not be panic purchases. Brayford, who is understood to have commanded a £1.5m fee, has been joined at United by former Derby County duo Kieron Freeman and Paul Coutts. Freeman, like Brayford, enjoyed a period on loan at Bramall Lane last term while midfielder Coutts, aged 26, has been capped by Scotland at under-21 level. “Every single player we are looking at is a player that Nigel wants,” Phipps added. “Every single player that (managing director) Mal (Brannigan) is negotiating with is one identified by Nigel and his team. Brayford made 20 appearances for United during the 2013/14 campaign and Selahattin Baki, Phipps’ fellow director, said: “We are here to do business. As much as we enjoy it, we are not here to visit Sheffield, put on a suit, take pictures with the fans. “John is a great player and he is also a grateful player,” Baki added. “I always remember when he left last time, he tweeted to say thank-you to the club and the fans for helping him. United, who could name Freeman in the squad which enters the second-leg of its meeting with Spurs hoping to overturn a 1-0 deficit following last week’s defeat at White Hart Lane, hope to make at least one new signing before next month’s deadline. Chris O’Grady, of Brighton and Hove Albion, is known to be Clough’s preferred option to fill the vacancy for a new centre-forward but his return to form at The AMEX Stadium means new manager Chris Hughton is unlikely to sanction his departure until a like-for-like replacement is identified. Defender Jason Pearce, who has been told he can leave Leeds, interested Clough’s earlier this season but United are now thought to be prioritising their attack rather than rearguard. Pearce has been on the fringe of Leeds’ starting eleven since Christmas and is being monitored by Wigan Athletic. Meanwhile, United have reminded supporters that the game against Mauricio Pochettino’s side is a sell-out. Tickets for February 3rd’s FA Cup replay with Preston North End are available from the box office priced £15 (adults), £10 (adult season ticket holders and concessions) and £5 (juniors). Season ticket holders have until 9am on Thursday to reserve their seats.